Yet another blog by a security enthusiast ! VirtualBox emulates VMware virtual SVGA device whose interface details and programming model is available publicly . Moreover, the paper “GPU Virtualization on VMware’s Hosted I/O Architecture”  is a great reference to the architecture of VMware SVGA device. Kostya Kortchinsky first published “CLOUDBURST - A VMware Guest to Host Escape Story”  detailing a VM escape using bugs in VMware SVGA device. Similarly Oracle also fixed a bunch of issues in their VMSVGA device (CVE-2014-6595, CVE-2014-6588, CVE-2014-6589, CVE-2014-6590, CVE-2015-0427) during the Critical Patch Update - January 2015 . “Attacking hypervisors through hardware emulation”  has some details regarding the VMSVGA bugs in VirtualBox. It is important to note that VMSVGA device is not enabled by default and probably has very limited users. However, the feature can be enabled as mentioned in the documentation of VBoxManage . Oracle fixed VMSVGA bugs CVE-2017-10210, CVE-2017-10236, CVE-2017-10239, CVE-2017-10240, CVE-2017-10392, CVE-2017-10407 and CVE-2017-10408 which I reported, during the Critical Patch Updates in July 2017  and October 2017 . CVE-2017-10210, CVE-2017-10236, CVE-2017-10239 and CVE-2017-10240 was also found by Li Qiang of the Qihoo 360 Gear Team . This blog post details some of these issues and demonstrate a VM escape using them. Analysis was carried out in VirtualBox version 5.1.22 for OSX. VirtualBox for Linux is not built with support for VMSVGA 3D features and are available only in Windows and OSX. face.numMipLevels value is used in multiple other commands leading to memory corruption. The PoC for CVE-2017-10210 demonstrates memory corruption using SVGA_3D_CMD_SURFACE_DESTROY command leading to invalid free(). Here “cbSurfacePitch” and “cbSurface” calculations can overflow since “paMipLevelSizes” values are fully controlled by guest. Further RTMemAllocZ ends up allocating less buffer size than actually needed (due to invalid calculation of “cbSurface”). This could lead to out of bound read/write during usage of “pSurfaceData” in other SVGA commands. The provided PoC only demonstrates an invalid allocation which can be inspected in a debugger and does not trigger any crashes. However, this bug will be later used in the full VM escape exploit. In this case, first the “paBoxes” validation against “pMipLevel” can overflow leading to bypasses. Then “uDestOffset” validation against “pMipLevel->cbSurface” can also be bypassed due to integer overflow. Similar code patterns were found in multiple places. “uDestOffset” is used for computing “pBufferStart” argument during the call to vmsvgaGMRTransfer, leading to out of bound read or write based on the value of SVGA3dTransferType - SVGA3D_WRITE_HOST_VRAM or SVGA3D_READ_HOST_VRAM. The PoC for this bug accesses memory at an offset ~4GB from pMipLevel->pSurfaceData leading to crash. This bug can be exploited by spraying the heap and allocating the accessed memory region. The “offSrc” validation can overflow and the check against “vram_size” can be bypassed. This leads to out of bound read or write relative to the VRAM. vmsvgaGMRTransfer is used by multiple SVGA commands like SVGA_CMD_BLIT_GMRFB_TO_SCREEN, SVGA_3D_CMD_SURFACE_DMA, SVGA_3D_CMD_BLIT_SURFACE_TO_SCREEN etc. In SVGA_CMD_BLIT_GMRFB_TO_SCREEN, the “offsetDest” is validated against the vram_size. Hence the destination of write can only start from within VRAM buffer. However, the “offsetSource” can end up pointing beyond VRAM buffer at a controlled offset, providing reliable info leak. The PoC provided demonstrates OOB access relative to VRAM using SVGA_CMD_BLIT_GMRFB_TO_SCREEN and SVGA_3D_CMD_SURFACE_DMA. Bugs in vmsvga3dSurfaceDefine() allows setting very large values for pMipmapLevel->size.width, pMipmapLevel->size.height and pMipmapLevel->size.depth but still end up allocating only the desired size heap chunks. This is very useful for further exploiting the integer overflows in vmsvga3dSurfaceDMA(). The first set of checks involving paBoxes can be bypassed since, pMipLevel width, height and depth are set to very large values in vmsvga3dSurfaceDefine(). Later these values are used for calculating the ‘uDestOffset’, which could be set to arbitrary value. Here one can set high values to either uDestOffset or (paBoxes[i].w * pSurface->cbBlock) or (paBoxes[i].h * paBoxes[i].d) to bypass the validation. In vmsvgaGMRTransfer(), (paBoxes[i].w * pSurface->cbBlock) and (paBoxes[i].h * paBoxes[i].d) are used in computing size arguments for memcpy() call. To keep sizes to sane values, let’s set uDestOffset to a large value, thus allowing read/write at an offset ~4GB from a surface allocation. In OSX, there are three types of allocations – tiny, small and large. For more details on the allocator refer the previous work  and . Tiny and small heap allocations falls at an address range of 0x00007fxxxxx00000, whereas large allocations occupies another address range 0x00000001xxxxx000. Either of this heap allocation can be targeted to exploit this bug. My choice was to target the tiny and small heap allocations. This is primarily because I was aware of tiny allocations holding pointers to vtable and other memory allocations, which could be corrupted for code execution. However, spraying the entire 4GB memory with tiny allocations is a very slow process. OSX supports small allocations up to the size of 127KB. So the idea is to allocate as much as small chunks as possible to speed up the heap spray and smaller amount of heap spray with tiny chunks. Creation and allocations of HGCMClient are done by HGCMService::CreateAndConnectClient in src/VBox/Main/src-client/HGCM.cpp. The client objects are maintained using a AVL tree. The nodes have client ID’s as key and also holds a pointer to object itself. During exploitation, we avoid corrupting the AVL tree metadata to prevent any crashes during lookup or insertion of AVL tree nodes. Further, the vtable of HGCMClient can be corrupted for gaining RIP control. 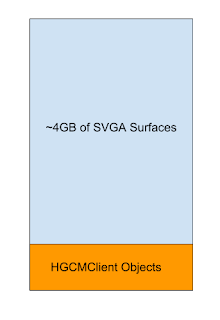 The deletion of HGCMClient objects happens during HGCM disconnect, which is handled by HGCMService::DisconnectClient where the corrupted vtable gets used. In order to fill 4GB, small chunks are much faster option compared to tiny chunks. SVGA_3D_CMD_SURFACE_DEFINE command can be used to allocate chunks of arbitrary size. Once heap spray is done, use the out of bound read to leak memory relative to the surfaces starting from SVGA3D_MAX_SURFACE_IDS – 1. If any HGCMClient is found, stop the search, else keep going. Once the client object is found, we know the location of the object by leaking its ‘pSelf’ pointer. The object’s vtable is a pointer to VBoxC.dylib. Both of this can be used to break ASLR. Later corrupt the object using the out of bound write relative to the surface id found during the search.